For this plugin to function properly it is necessary to have or create 2 custom fields, latitude and longitude (existing in sobi from version 2.9.2.2). The plugin need to know the fields you used to defined the address (City, Street, Zip code, ...) of the entries. 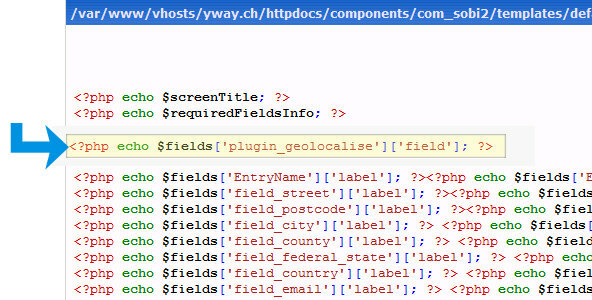 For that first you need to create that fields and assign each fields in Geolocalise plugin Parameters Tab. Normaly that fields are installed by default. If you deleted you need to re-create because the plugin is unusable without it. Your website need to have the Google API Key defined. Google Maps API lets you embed Google Maps in your own web pages. A single Maps API key is valid for a single "directory" or domain. Open your site in backend, and select the menu Components > Sobi2. Once in the component Sobi2, go to the left side menu and choose Plugins > Plugin Manager and choose Geolocalise. Go to Parameters tab and find "Geocode parameters" line. Latitude and Longitude fields: Assign the items with the SOBI2 Fields (1), defined in SOBI Custom Fields Manager for latidute and longitude values. Valid latitude: If you need to limit the latitude for SOBI entries, please choose desired value (2). If leave emty you have no restriction for latitude coordinates. Valid longitude: If you need to limit the longitude for SOBI entries, please choose desired value (3). If leave emty you have no restriction for longitude coordinates. Precision: Setting the position precision for entry on the map: choosing the high precision get the exact coordinates, the medium use the random tolerance of about 100m and the low about 1 km. Here you can define one by one corresponding fields for postal address. Please assign the items with the SOBI2 fields for: Adress; Postcode; City; Country; State; County. Open your site in backend, and select the menu Components > Sobi2. 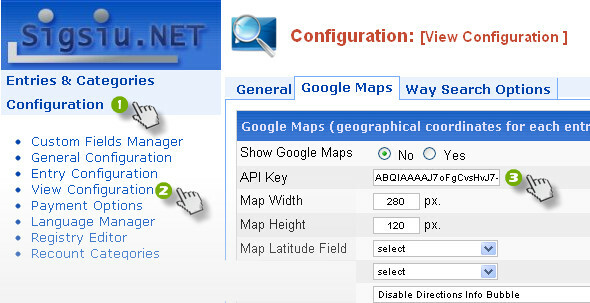 Once in the component Sobi2, go to the left side menu and choose Plugins > Plugin Manager and choose Geolocalise. Go to Parameters tab and find " Fields parameters" line and set the items as shown bellow. This plugin dont have any frontend in detailled and category view. The standard Sobi2 map is shown.